In May 2013, a sanitation worker collecting trash in an alley in Moundsville, West Virginia, was killed when a broken limb fell from a tree and struck him in the head as he was collecting trash. The limb was apparently damaged in a recent storm; it is unclear whether the truck struck the branch. The worker suffered a massive head injury and was transported to hospital, where he was pronounced dead. This was called a “freak” accident, but legally, could there have been any premises liability for this fatal injury? As a home and property owner, you have a legal duty to keep your family and neighbors safe from tree hazards as much as it depends on you. This list is not all-inclusive, so if you have any doubt about the soundness of the trees on your property, hire a specialist to inspect and evaluate safety issues. Tree owners are not expected to have the expertise of a certified arborist in evaluating tree risk, but there are common defects and situations for which a tree owner may be held responsible as a “reasonable person” in the eyes of the law. A hazard tree is one that has both a defect that may cause it to break apart or blow over prematurely and a target that could be damaged if the tree were to fail. A tree that has dead branches overhanging a sidewalk or street is a hazard because the dead branches may break off, striking a car or pedestrian. Without a potential target, a tree cannot be considered hazardous. Targets include houses, cars, outdoor decks, and, of course, people. We recommend that private tree owners should inspect their trees twice annually: when the leaves are on the tree (spring and summer) and, for deciduous species, when the leaves are off the trees (late fall and winter). 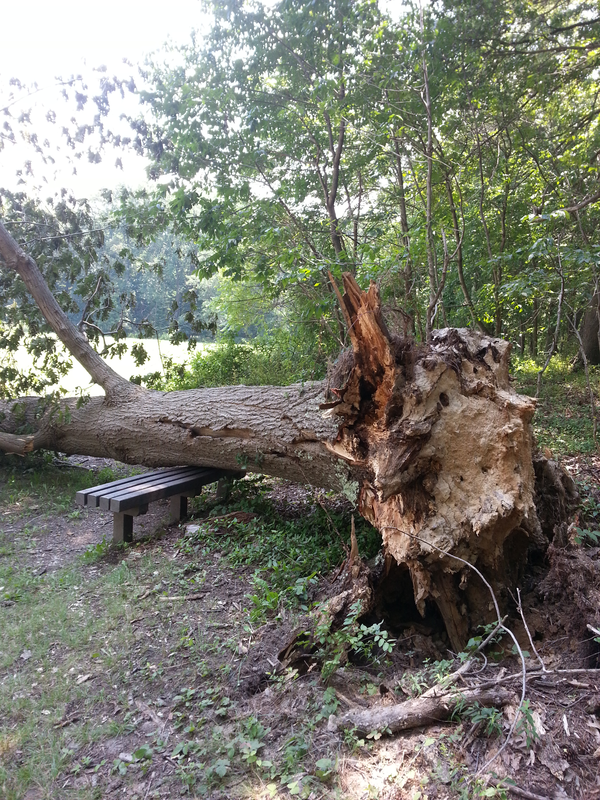 Tree owners should also inspect their trees after severe wind events and storms. This is important because strong winds frequently cause tree damage such as broken branches, and cracks in the trunk. The liability United States tree owners face from hazardous trees on their private properties has and continues to undergo a transformation. The traditional common law legal test focused upon whether a tree owner had acted to create a hazardous condition on the property. When a tree owner did not act to create a hazardous condition on his or her property, the law did not hold the tree owner responsible for tree accidents. Essentially the law would not impose liability for the tree owner’s failure to act to remedy a natural hazard. Only in cases where the tree owner had in some way acted to create or increase the risk of harm would liability attach to the tree owner. For example, removing a portion of a stand of trees, thus leaving the remainder susceptible to wind throw could be an example where a human act created a potentially dangerous tree situation. Legal liability for private tree owners by structurally deficient trees or tree limbs has been undergoing a legal evolution over the last four decades. The modern trend is towards a test that imposes greater responsibility and greater uncertainty on tree owners and arborists. Abandoning the natural/artificial distinction, the modern test, adopted in half the U.S. jurisdictions, imposes general principles of negligence on tree owners. Courts in each of the “modern” U.S. jurisdictions, however, have ruled in falling tree and tree-related cases that tree owners owe a duty to both passersby and other property owners to prevent harm to them from potentially dangerous objects on their properties. The direction in which the trend appears to be proceeding raises the stakes for tree owners. Whereas immunity from legal liability may have previously existed, such liability can now more easily result from a tree owner’s actions or failure to act. The responsibilities of individual tree owners, particularly in urban areas, have increased in many states, and nothing suggests that the trend will abate. Since the U.S. legal trend is clearly toward greater liability for hazardous trees, this warrants paying closer attention to the condition of one’s trees more than ever before. An example in the state of South Carolina was a lawsuit involving a decayed tree limb which fell onto an adjoining property owner’s land, striking and destroying an occupied automobile and injuring its occupant. The tree owner argued that the law did not impose any duty of inspection on a tree whose limbs happened to overhang an adjoining business property. The court did not agree, determining that while that may have been the prior rule, the modern rule requires the exercise of reasonable care to prevent dangerous trees from causing such injuries. the breach was the cause of the injured party’s harm. Since the modern trend is to establish in law a duty on the part of the tree owner to identify and repair or eliminate dangerous or hazardous conditions on the property, the modern threshold test is merely, was the dangerous object under the control or supervision of the tree owner? But how does a court assess whether the tree in question was in fact hazardous or dangerous, and additionally, whether the tree owner’s legal duty to eliminate the hazard was triggered? The legal principle at work essentially states that if a tree owner is actually aware, or should have been aware, of a defect or risk posed by a tree, remedial action is warranted, even required. A tree owner must act as a reasonable person would have acted in the same circumstances. If you have suffered as a result of a fallen tree, broken limbs, or injured by any other premises hazard, we are here to help. If you have any questions or are not sure if you have a case, call Jeff Robinette of the Robinette Legal Group, PLLC today and get the answers and help you need. Call today: 304-594-1800 or 24 hour line: 304-216-6695. Luckily this is not a frequent occurrence but, it is also something that causes injury and death here in California as well. This is especially true in the winter months when heavy rains soak the soil and trees that are not trimmed properly collapse due to their weight and lack of root suppport.